We learn about Tiberias old & new, the ancient city founded in the 1st century sits on Israel’s main source of fresh water, the Sea of Galilee. We also saw the tombs of the famous sages Rambam & Rabbi Akiva, their unique lives and circumstances of death; both are interred in Tiberias. It is here that King Saul was defeated by the Philistines in a vicious historical battle. Later in the time of Alexander the Great, Beit She’an was reestablished as a Greek city with colonnaded streets, temples, theaters, and fountains. All this was devastated by an earthquake in 749CE, remnants of shrines and colonnaded streets were left behind. What an amazing place. You can feel the history and see what life must have been like. It is huge - and they have only excavated one third of it. The mountain top with many stairs overlooks the entire valley. Who knew what was in store for us! Words cannot described what we saw ... but pictures can! 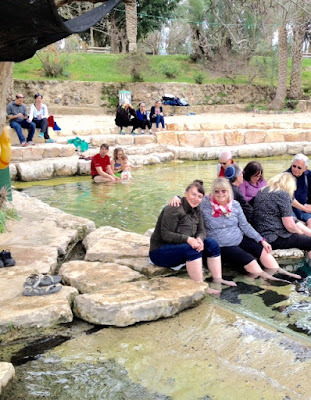 Chosen by Time Magazine as one of the world’s 20 most beautiful parks, we relaxed and rejuvenate at one of the natural pools or Jacuzzis that are idyllically situated below a flowing waterfall. It was too cold to go swimming, but Gail stuck her feet in the water and got a pedi from the tiny fish tickling everyone's feet! We ended the day with a beautiful drive through the Jordan Valley and ascended to Jerusalem, as our tour guide played " Jerusalem on Gold" for us on the loud speaker. We stopped at Mount Scopus as we entered the city at sunset, had a cup of wine, and said the blessing of “Shehechiyanu” to celebrate the joyous occasion of entering Jerusalem, our eternal Capital. Filled with boutique shops and locally owned cafes, Jerusalem is the opportune place to relax and shop. Explore the Machne Yehuda Market, the store lined streets of King George St. and Jaffa St. or head out to the fabulous restaurants on Emek Refaim Street. Do you think that's what we did? NOT! We got to our hotel at 7:00, had a quick dinner at the hotel and literally FELL into bed. Thanks Karen ... learning so much! Just surfacing from the army now for a weekend in Tel Aviv ... then back to the base on Sunday.